Painted “Black Obsidian” the QX56 looks as menacing as a nuclear submarine. This is no pretty plaything. 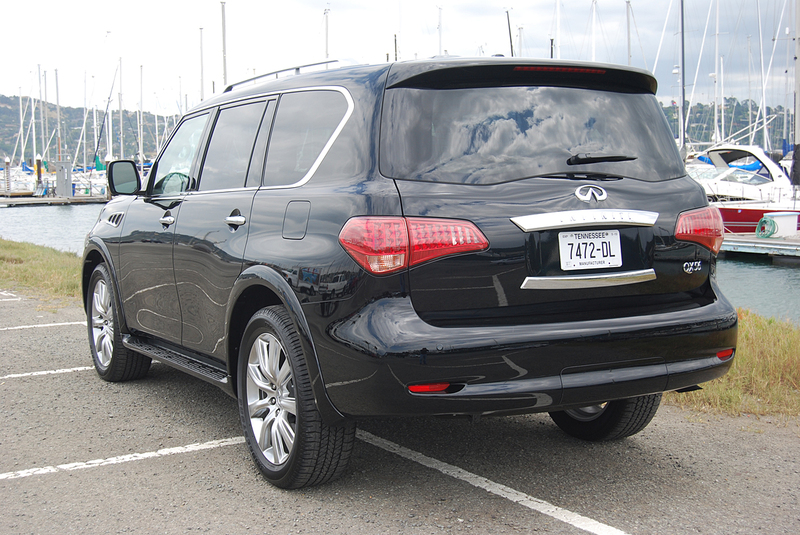 Bereft of deft sculptural touches, the chunky QX56 depends on brutality for its brand of beauty. Up front, the immense chromed grill, guarded by slit headlights, makes the hulk look like a Brahma bull. 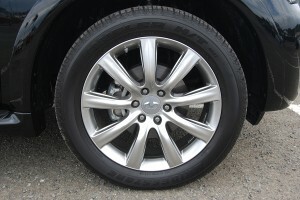 Optional ($2,450) 22” wheels and ultra-wide 275/50HR22 Bridgestone Dueler tires stand so tall they force you to do the Texas two-step when climbing up into the cabin. Standard running boards are essential for short folks. Once ensconced in this plush expanse of Wheat Semi-Aniline Leather and Tuscan Burl Trim, you’ll enjoy a commanding view of the road in all directions. 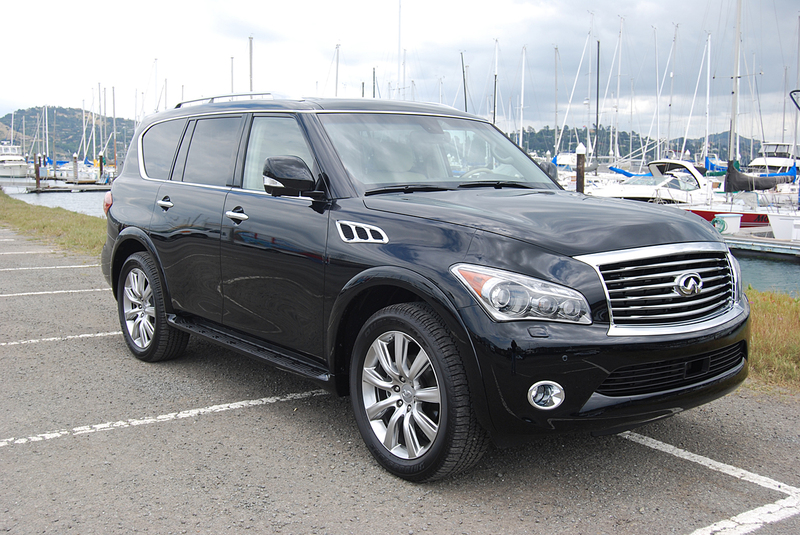 Unlike so many taper-tailed SUVs that trade vision for styling, the boxy QX56 offers excellent sight lines. Even though you’re far removed from pavement height, you can still park this mammoth craft with surprising accuracy thanks to unimpeded vision. Additionally, a standard “AroundView” monitor offers sonar detection of moving objects both front and rear. Although Infiniti offers a 2WD version of the Q ship for a base price of $60,650, the $3,100 extra you spend on the 4WD version (base price: $63,750) is money well spent if it rains or snows where you live. Moreover, the earth mover size Bridgestone tires, being mud and snow rated, are just itching to strut their stuff in the sloppy outback. Infiniti provides a comforting control knob on the center console with settings for Snow, Tow or Go. The trailer setting allows you to haul a whopping 8,500 pounds behind the Q. The computer-controlled transfer case offers low and high ranges of 4WD. During our dry and sunny week with the Q, we left the controller in 4WD High range and found the big beast to be marvelously effective at conquering any paved terrain we chose to tackle. On twisty backroads, the Q defies its size and near 6 ton weight by blasting through turns with aplomb. Out on the Interstate, it mimics a palatial living room on wheels, especially when equipped with the optional ($4,650) Deluxe Touring Package, which exchanges the standard 13 speaker Bose Premium Sound System for a 15 speaker installation with Surround Sound and digital 5.1 decoding. This unit is really adept at thumping out tunes sourced from XM Satellite radio, MP3 playback, USB Ipod interface, or streaming Bluetooth – all of which are included in the entertainment package. Precise control of front, side and rear micro-climates keeps all passengers happily pampered in their own comfort zones. In view of the fact that this mother ship can safely carry as many as 8 adults, specific zones for air conditioning and heat are important to group satisfaction. If you choose to fold one or both of the rearmost bench seats, you can easily do so via (slow) electric controls for each side. The second row seats also collapse and fold forward against the backs of the front seats. But if you plan on carrying bulk loads inside your QX56, you’ll want to order your Infiniti with a second row bench seat rather than the pair of captain’s chairs of our test vehicle. A second row bench folds flat whereas the console dividing the captain’s chairs remains a standing impediment even when the chairs are flipped forward. 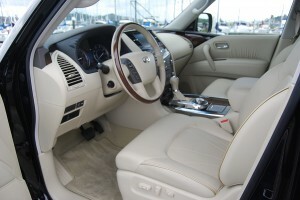 The QX56 relies on a thirsty but powerful 5.6 liter V-8 which produces a startling wallop when the throttle is floored. The 7-speed automatic transmission features downshift rev blipping and manual gear selection in addition to very savvy Adaptive Shift Control automation. With 400hp and 413 lb.-ft. of torque on hand, you’ll never encounter a situation that taxes the power limit of this SUV. But you will pay for the privilege because the QX manages just 16 MPG in overall driving. But if you can afford the gas, as well as the pricey buy-in, the QX56 is the stoutest, sturdiest piece of equipment a large family could ever need.